Reproduction, romance and Delta and the Bannermen (1987) | Randomwhoness: a Doctor Who blog by Johnny Spandrell. Sampling stories in random order. Mysterious creatures, Bannermen. They’re infamously ruthless warriors who carry banners on their backs wherever they go. Awkward, unwieldy banners, which wobble precariously when racing into battle. Well, I say ‘racing’. Most of the Bannermen are ageing, pudgy extras and a slight trot is about as much as they can muster. I agree with Agent Weismuller (Stubby Kaye): they’re the sorriest bunch of Bannermen I’ve ever seen. And for terrifying mercenaries they’re not exactly what you’d call bright. They can be confused by tying one of their tracking devices around the neck of a goat. And they insist on standing around while shelves of honey slowly fall all over them. And I don’t want to be prurient, but they ought to spend a bit more time finding some Bannerwomen if they want this race of theirs to survive. Also, they’re genocidal. Yes, that’s a surprise isn’t it? Given they seem to the untrained eye to be ineffectual buffoons, who’d have thought that true villainy lay hidden under those baggy flight suits? And they’ve been surprisingly successful at it, having hunted down all but one of their targets, the Chimerons. And while the Bannerfellows have remembered to pack some useful equipment like their banners (natch) and a dual neck yoke thing for entrapping hapless Americans, they seem to have forgotten that their key weakness is a susceptibility to the song of their Chimeron target. So presumably they should have packed some ear muffs. C’mon Bannermen, it’s step one. Chimeron Queens, it seems, are hot blondes while the males of the species have faces covered in green play dough. We can see who got the rough end of the evolutionary stick there. Still, they seem like an inoffensive enough race, which makes you wonder why the Bannermen hate them so much. We never find out. They just do. As drone bees are attracted to their queen, so dream boat mechanic Billy (David Kinder) is irresistibly drawn to fugitive Chimeron Delta (Belinda Mayne). He’s been messing about with valley girl Ray (Sara Griffiths), but one look at Delta and that’s all over. Like most blokes, he looks a bit shellshocked when he realises his new squeeze has a baby, and as this one’s green and covered in goo he’s got more cause than most. Billy’s a bit prone to making impulsive decisions. Having dumped Ray at the first swish of a blonde ponytail, he very quickly decides he’s in it for the long haul. He’s not at all phased when the baby grows into a teenager within hours, and as any stepfather will tell him, he should be. But even more drastic is his decision to start ingesting some of Delta’s transformative green gunge and mutate into a Chimeron, so that he and Delta can fly off into the sky together and start work on rebuilding that species. If ya know what I mean. Bannermen, take note. 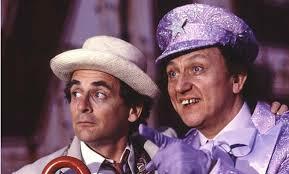 The Doctor (Sylvester McCoy, in his first season and at this stage still playing the part as 90% goofball) and companion Mel (Bonnie Langford, the apex of perkiness) meet Delta and the Bannerblokes when they tag along with a party of vacationing aliens, the Navarinos. They are purple blobby types who like travel and like a bit of cosplay. They feel like creations of Douglas Adams. They’re not particularly phased when their spaceship (disguised as an old bus to fit in with its late 1950s surroundings; better make sure that chameleon circuit doesn’t get stuck) crash lands in Wales not Disneyland. They’re up for a dance and sing-a-long. They seem like loads of fun. So it comes as a shock when they’re all blown up half way through Part Two. Juxtaposition is what Doctor Who does, but this is surprisingly jarring. Delta’s tone immediately before and very shortly after the bus explosion is bright and breezy, all sunshine, nostalgia and happy days. The killing of the Navarinos might feel like a sudden, brutal lurch in the opposite direction to the one the story’s taking. Or it might feel like a brilliant inversion against expectations, a sudden reminder that this is serious stuff. It’s a common tactic used throughout Season 24. A similar stunt is pulled in Dragonfire, when a shuttleload of escaping shoppers explodes. Paradise Towers is at times played for laughs but it is actually a story of systemic murder. And Delta is about genocide, played out like light entertainment. Rarely in Doctor Who‘s history has the darkness of its themes been so far removed from the lightness of its tone (The Myth Makers maybe? Or The Gunfighters?) But it’s the inclusion of a specific, violent incident mid story which wrong foots the viewer. It’s like if City of Death included a scene where Scarlioni massacred dozens of onlookers in the Louvre, but stayed in all other aspects the same. Unsettling. “Take a look at this butterfly,” lilts Garonwy (Hugh Lloyd), a dotty old beekeeper and one of Delta’s legion of supporting characters. “Arguably one of the most beautiful creatures in the whole of nature. Yet if you were to see a pupae, you’d think it was the ugliest sight you’ve ever seen. But you can’t have one without the other.” That little speech articulates the story’s main theme; that change is an inevitable and essential part of life. Many of Delta‘s diverse elements reflect that theme. But surely it’s also a commentary on Who itself, at this stage still responding to a new Doctor, a new Script Editor and a new creative energy. Delta and Season 24 have never been particularly popular with fans. In fact they’ve been spectacularly unpopular. But maybe even this story’s critics would recognise that the best of the McCoy era came after this wildly experimental first year, and perhaps we wouldn’t have had one without the other. LINK to The Sea Devils. Both are about non-human races fighting for survival. And both have um… distinctive incidental scores! NEXT TIME… By the pricking of my thumbs, something wicked this way comes and it’s The Robots of Death.